It’s been a weird winter, weather-wise, but aren’t they all one way or another? My flowering plum is blooming weeks early. I have an Autumnalis flowering cherry tree that blooms several times a year. The last blooming cycle started in late November and it’s still blooming now. This tree came into my life 20 years ago as a bare root tree. We’re old friends. Now is the time to add ornamentals and edibles like fruit, nuts, berries and vegetables while they’re available in bare root form. They are easy to plant, economical and establish quickly. Shop for your plants in January or February while they are still dormant. Once leaves emerge or flower buds start to swell, roots have already started growing. You want your tree to start developing new permanent roots in their final home. Stone fruits such as apricots, peaches, plums and cherries are going to start waking up first so they are best put in the ground soon. Fruit trees like pears and apples wake up later so you can wait a bit longer to plant those varieties. What fruit tree varieties can you grow here in the mountains? Well, almost everything. Most of us get 700-900 chilling hours per winter. What does that mean? Well, many fruit trees, lilacs and peonies need a certain number of hours during dormancy where the temperature is 45 degrees or less. You can give the plant more chilling in the winter but not less. Those in coastal Santa Cruz can grow Fuji apples as they require only 300 hours of chilling but not Red Delicious. We can grow both. What if you don’t get full sun where you’d like to grow fruit trees? Apples, pluots and plums are good choices for an area that gets some sun- at least 5 hours a day during the growing season. The ideal is full sun but these trees will still set and ripen some fruit in partially shaded conditions. With peaches, nectarines or apricots it’s a different story. These fruits need hot sun to develop sweet, tasty fruit. Too little sun and they will not deliver anything close to what you have in mind. Don’t plant in heavy saturated soil with a high clay content, however. If your soil drains poorly it’s best to place your bare root tree at an angle in a trench, cover with soil and water in. Wait to plant until the soil is crumbly and friable with plenty of pore space. Digging in waterlogged clay soil is one of the worst things you can do for your soil’s health. With a little planning you can have fresh fruit 7 months of the year. By growing your own fruit you’re not at the mercy of mechanical harvesters and shipping practices. You can grow fruit and harvest it when the time is right. Homegrown fruit is a world apart from agribusiness and much less expensive than the Farmer’s Market. Take advantage of those rare breaks in the weather to get basic chores in the garden done. Who thought last fall we’d be wishing for less precipitation or at least that it would be spread out over a longer time? Looking back at National Oceanographic & Atmospheric Administration (NOAA) winter season predictions from last November, their best guess was that our La Nina condition was weak and drought was expected to persist in California. Let’s hope our record rainfall makes its way down into the aquifer. What should a gardener be doing between rain storms? Shop for bare root plants. If you want to add fruit trees or other edibles to the garden and the weather has interfered with your plans don’t delay. Shop for your plants now while they are still dormant. Once leaves emerge or flower buds start to swell tree roots have already started growing. You want your tree to start developing permanent roots in their new home. Stone fruits such as apricots, peaches, plums and cherries are going to start waking up first so they are best put in the ground soon. Fruit trees like pears and apples wake up later so you can wait a bit longer to plant those varieties. Bare Root Fruit Trees- What, When and Why? I have an Autumnalis flowering cherry tree that blooms year round. The last blooming cycle started in late November and it’s still blooming now despite heavy rains. This tree came into my life 20 years ago as a bare root tree. We’re old friends. Now is the time to add ornamentals and edibles like fruit, nuts, berries and vegetables while they’re available in bare root form. They are easy to plant, economical and establish quickly. Every year there are more fruit tree varieties available in bare root including delicious time honored heirloom varieties as well as modern favorites. It’ll be hard for me to decide which ones I’ll recommend for edible gardens I design this year. teacher extraordinaire at UCSC Alan Chadwick garden visited a group of fellow landscape designers bringing with him a bag of his favorite apples. As he cut slices of each for us to sample his highest praise went to Cox’s Orange Pippen, Golden Delicious, American Golden Russet, McIntosh and Mutsu apples. Plant these varieties and you could be eating apples from August through October. Did you know that at one time in American history russet apples were the most desired and wages were actually paid in cider made from russet apples? If it’s peaches you crave, Renee of Mountain Feed & Farm Supply shared with me some peach leaf curl resistant varieties they carry. Listed by UC Integrated Integrated Pest Management Program they include Frost and the Q-1-8 white peach. The Frost is a medium-sized, freestone yellow peach with a delicious flavor. It has showy pink flowers in the spring. They ripen in July and require 700 hours of winter chill. The Q-1-8 peach ripens in July also. This white-fleshed, semi-freestone peach is sweet and juicy like Babcock and has showy blossoms in late spring. Peaches are self-fruitful and don’t require another peach to pollinize them. What fruit tree varieties can you grow here in the mountains? Well, almost everything. Most of us get 700-900 chilling hours per winter. What does that mean? Well, many fruit trees, lilacs and peonies need a certain number of hours during dormancy where the temperature is 45 degrees or less. You can give the plant more chilling in the winter and that’s just fine but not less. Those in coastal Santa Cruz can grow Fuji apples as they require only 300 hours of chilling but not Red Delicious. We can grow both. plums and cherries are going to start waking up first so they are best put in the ground soon. Fruit trees like pears and apples wake up later so you can wait a bit longer to plant those varieties. With this in mind be wary of spring sale bare root stock. Also trees in packages may have had their roots pruned to fit inside or the packaging material may have dried out or become soggy. Better to see the roots for yourself before you bring your new addition home. When May rolls around I’ll be anxiously awaiting the first cherries, apricots and peaches. Then the early nectarines arrive, sweet and juicy followed by the plums that ripen next. Later in the summer apples, figs and pears make their debut as well as late ripening plums and peaches. With a little planning you can have fresh fruit 7 months of the year. By growing your own fruit you’re not at the mercy of mechanical harvesters and shipping practices. You can grow fruit and harvest it when the time is right. Homegrown fruit is a world apart from agribusiness and much less expensive than the Farmer’s Market. Growing fruit in your garden or home orchard may be even more important in the future than ever before. The lack of rainfall last year and this winter will probably raise the price of fruit at the market. If the water farmers rely on is rationed during this years growing season, fruit production will also suffer. You can start growing your own fruit by planting a bare root tree now and this is how to do it. It only takes a few years for a young tree to start producing. By using lots of mulch and perhaps installing a laundry to landscape gray water system, trees require a fraction of the water as other landscaping. Just imagine eating fruit off your own trees. One of the primary advantages of bare root plants is that they tend to have an extensive, well developed root system as a result of being allowed to develop normally in the ground. They are dug while dormant. When the trees are handled well the root system is left intact and the tree has a better chance of rooting well and surviving when planted. Bare roots don’t have to adapt to any differences between container soil and the garden soil. Bare root trees are also less expensive to ship because they have no soil on the roots making them much lighter and easier to handle. Shop for your plants in January or February while they are still dormant. Once leaves emerge or flower buds start to swell tree roots have already started growing. You want your tree to start developing their new, permanent roots in their permanent home. Stone fruits such as apricots, peaches, plums and cherries are going to start waking up first so they are best put in the ground soon. Fruit trees like pears and apples wake up later so you can wait a bit longer to plant those varieties. What is the proper way to plant a bare root tree? Select a spot with at least 6 hours or more of summer sun. To test for drainage if you have heavy soil, dig a hole about a foot deep. Keep the organic top soil from the top of the hole separate from the soil you dig out from the bottom of the hole. Fill the hole with water. If the water drains within 3-4 hours, fill the hole again. If it takes longer than 3-4 hours to drain on either filling you will either have to find another spot, build a raised bed or berm or plant in containers. If you are happy with your location, dig the planting hole 24″ wide x 24″ deep again keeping the organic matter separate from the sub soil. Ultimately, trees must grow in the surrounding soil. Don’t amend your soil unless it is very sandy. If you amend the slow draining native soil around the tree the hole will just fill with water killing the tree. Adding organic amendment to extremely sandy soils, however, can help retain moisture in the root zone. Place your tree in the hole and start filling in around the roots with the sub soil first, then the organic top soil. Wiggle your tree as you fill in around it to settle the soil. Tamp down the soil lightly with your foot when the hole is half filled and then top off the hole with the organic top soil. Stake the tree low and loose for the first couple of years. You want to keep the root zone stable in the wind while it is becoming established but allow the top of the trunk and branches to move with the wind. They will grow much thicker faster. Water in well and again the next day. You should not need to water again until the tree there is new growth of several inches. Prune the central leader and branches of your new tree 1/3 to 1/2 to a plump bud facing the direction you would like the new growth to grow. Mulching is especially important to bring back the beneficial organisms in the soil. Bioactivity reduces fertilizer requirements. Mulching keeps the ground cooler in the summer and retains moisture. After your tree is established you can fertilize with an organic fertilizer. Keeping the nitrogen low but the phosphorus and potassium higher will help control the size of the tree making it easier to harvest that delicious fruit. 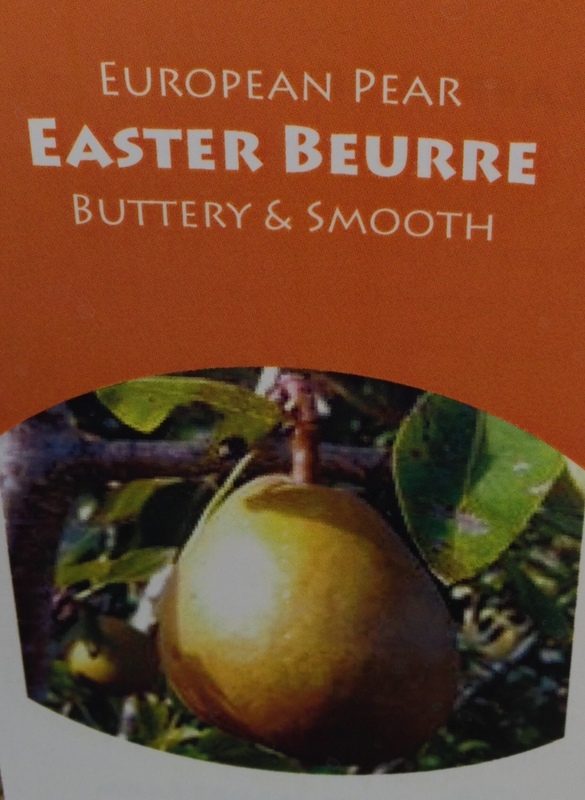 This year I have my eye on an heirloom French butter pear called Easter Beurre that ripens in December with tender, sweet, melting flesh. 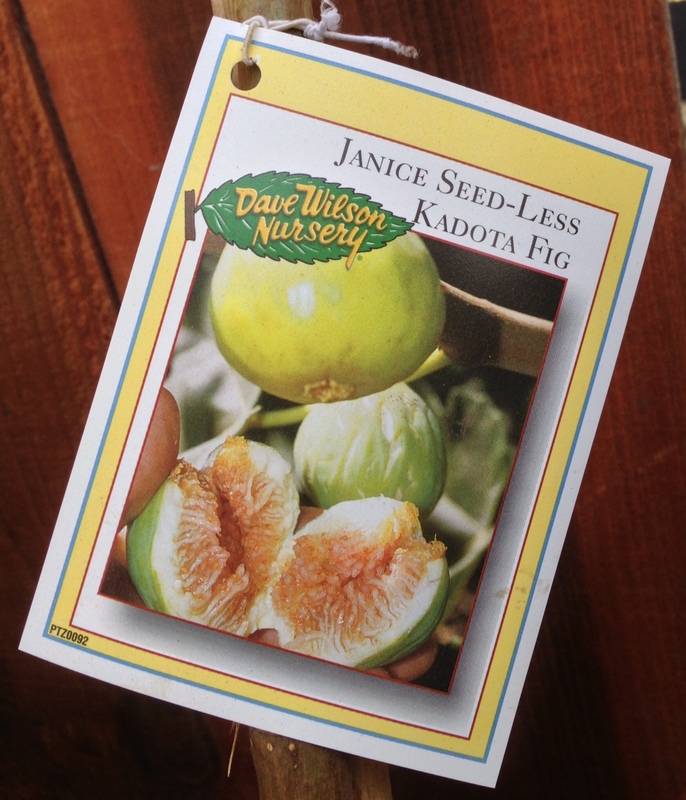 Also I want to try the Janice Seedless Kadota fig with it’s incredibly sweet flavor. It’s said to have better flavor than Black Mission. I think they should have named this fairly new fig after me spelling it Janis but it’s too late now. Don’t miss the opportunity to add a fruit tree to your garden this winter. It’s bare root season again. There’s something magical about a small leafless tree with bare roots that will produce mouth-watering fruit when it grows up. Even ornamental shade trees, flowering shrubs like lilacs and vines like wisteria start out looking like twigs. 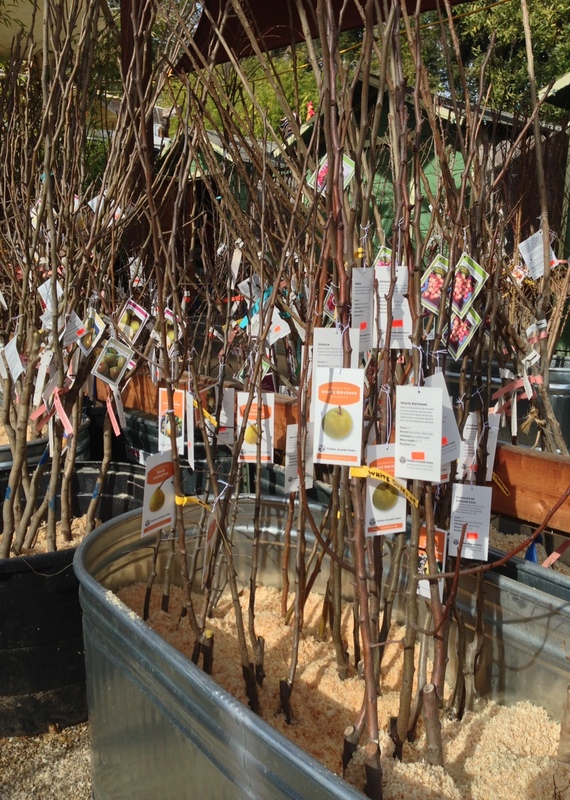 Buying a new addition for your garden or home orchard in bare root form is economical. They establish quickly and are easy to plant. Every year there are more types available including delicious time honored heirloom varieties as well as modern favorites. It’ll be hard for me to decide which ones I’ll recommend for edible gardens I design this year. A visit to Mountain Feed & Farm Supply in Ben Lomond has me inspired. They specialize in edible plants and trees as well as all things related to harvesting and preserving them. Renee was eager to share with me her favorite fruit tree varieties. Many of these delicious heirlooms are locally grown here in the Santa Cruz Mountains by Tierra Madre Farms who use organic farming practices to keep the trees and the soil healthy. I like the idea that this small farm is dedicated to promoting and preserving our world’s crop diversity. I’d never heard of some of the bare root heirloom varieties I saw buried in tubs of sawdust so I did a little research to find out what all the fuss was about. Why had they passed the test of time and then disappeared off our store shelves? By growing your own fruit you’re not at the mercy of mechanical harvesters and shipping practices. You can grow fruit and harvest it when the time is right. Homegrown fruit is a world apart from agribusiness. Who doesn’t look forward to the first cherries of the season? Plant an Early Purple Guigne cherry and you’ll be the envy of the neighborhood. This heirloom has been grown in this country since the early 1800’s and figured in a court case in San Jose in 1884. Seems a Mr. Bassford bought 300 of these bare root trees in December of 1897. When they fruited several years later he found that the cherries were quite different from the variety which he had paid for. Court records show that he claimed the cherries were inferior in size and appearance to the Early Purple Guigne that he had wanted and were nearly valueless to him on the market. He sued but lost his case after testimony revealed and Judge Spencer ruled that the name Early Purple Guigne applied to different types of cherries in different localities and the original bare root trees were not fraudulently sold. Another early ripening cherry to try is the classic Governor Wood which produces beautiful sweet and juicy, golden-yellow fruit with a red blush. Introduced in 1842 this cherry is still prized for its abundant crop of delicious fruit. How about a sour cherry like Montmorency? This heirloom dates back to 300 B.C. but it was the French colonist who first planted cherry pits along the Saint Lawrence River in the 1600’s. Michigan produces over 90,000 tons of this bright red cherry with yellow flesh and clear juice. Here’s a win-win growing tip for cherry trees. Birds love cherries as much as we do but if you prune your tree when young so it branches low on the trunk, you can harvest the lower cherries for yourself and let the birds take the fruit from the upper branches. Apricots also ripen early and heirloom varieties that I recommend are the classic Blenheim and one called Hemskirk which is considered one of the very best apricot varieties with bright orange, rich and juicy flesh. 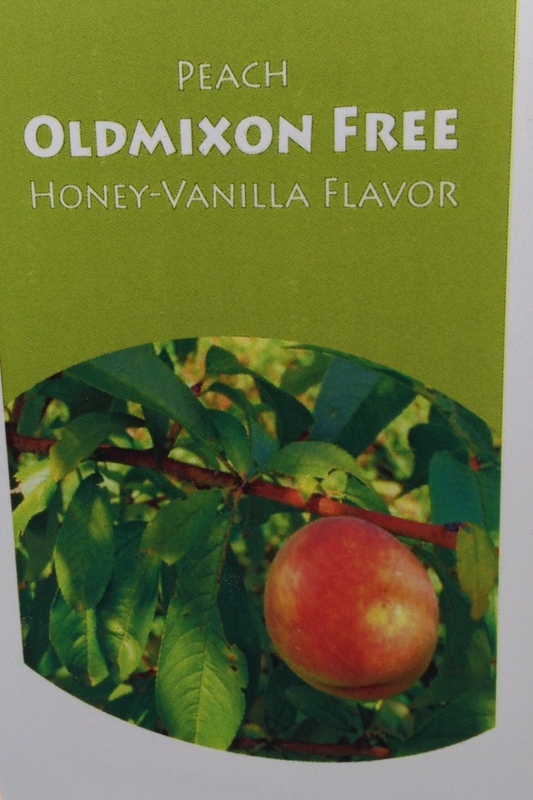 An excellent heirloom peach to consider is the Oldmixon Free. in 1807 cuttings of this peach were sent to Thomas Jefferson at Monticello. It’s stunningly beautiful while in bloom and the juice of Oldmixon Free peach is candy sweet. What fruit tree varieties can you grow here in the mountains? Well, almost everything. Most of us get 700-900 chilling hours per winter. What does that mean? Well, many fruit trees, lilacs, and peonies need a certain number of hours during dormancy where the temperature is 45 degrees or less. You can give the plant more cold in the winter and it’ll like that just fine but not less. Those in coastal Santa Cruz can grow Fuji apples as they require only 300 hours of chilling but not Red Delicious. We can grow both. Next week I’ll tell you about more luscious tasting plum, apple, fig and pear varieties you’ll want to grow. I’ll also give you tips on how and where to plant your new tree.